When Space Invaders was released way back in 1978, invariably it would lay down the fundamentals of the shooting game genre. We may refer to this genre simply as shooting games, shmups or even STG’s as the Japanese prefer to call them. However, I wish to clear something up first. A game like Space Invaders is not a shmup in the true sense. This is often a reference to shooting games that have a forced scrolling background either horizontally or vertically. 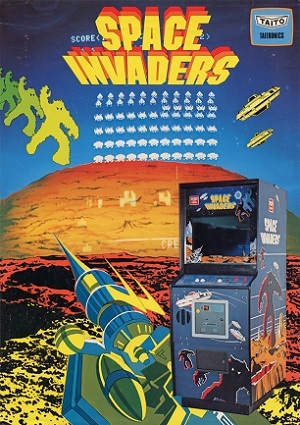 At the very least, Taito’s Space Invaders can be defined as a proto-shmup for lack of a better term. Genre categories and deviations are not that important right now. The core game mechanics of all shooting games are similar. As the title of this post clearly indicates, it’s all about shooting and dodging. Simple really, almost primal. That’s the main draw after all, shooting the enemy while avoiding getting hit yourself. Computers have always been able to handle shooting games incredibly well. It’s a piece of cake for even underpowered systems to make things appear and disappear on screen. All this may give the impression that developing a shooting game is easy peasy! If only that were the case. Simplicity should never be underestimated in regards to making things – easier. It takes some deft skills and an elegant touch to piece together a playable shooting game. Developing one for commercial release will often require months of play-testing and polish. Shooting games also demand a sharp eye for detail. Not just the visual aspect, but also every single enemy placement, every movement and every pattern. And it doesn’t stop there, every bullet that will be fired, direction of fire and even colour, size and damage it can inflict all have to be taken into account. In some cases, these can all total up to over a hundred sprites on screen at once. With so much happening on the screen, there is plenty that can go wrong. The worst in my opinion is leaving very little wiggle room for the player. So incredibly confined that a direct hit is often unavoidable, thus rendering the game either unfair or unplayable. Reducing the size of the player sprite hitbox is a common solution. My preferred method to solve this issue is smart enemy placement and firing rates. There are various other solutions, but I won’t go further now. What’s vital is ensuring that shooting and dodging are both fun. It’s essentially the yin and yang of the majority of shooting games and what makes them addictive. Great article. One of the best games ever created! I think Namco perfected it in Taito. One thing that always struck me is it’s similarity to Breakout (which itself was designed to be single player Pong). I wonder how much influence Pong and Breakout had on Taito when they came up with this classic? I am glad you liked the article and thanks for your feedback. Space Invaders is indeed one of the most important games ever developed. Pong and Breakout definitely had an influence on Taito, especially with their Arkanoid releases. Even on Space Invaders, the player craft does feel like the paddle on Pong and Breakout.